Over the past decade, the application of bootstrap methods to new areas of study has expanded, resulting in theoretical and applied advances across various fields. Bootstrap Methods, Second Edition is a highly approachable guide to the multidisciplinary, real-world uses of bootstrapping and is ideal for readers who have a professional interest in its methods, but are without an advanced background in mathematics. With a strong focus on application, detailed explanations of methodology, and complete coverage of modern developments in the field, Bootstrap Methods, Second Edition is an indispensable reference for applied statisticians, engineers, scientists, clinicians, and other practitioners who regularly use statistical methods in research. It is also suitable as a supplementary text for courses in statistics and resampling methods at the upper-undergraduate and graduate levels. Michael R. Chernick, PhD, is Principal Senior Statistician at United BioSource Corporation, providing statistical design and analysis for pharmaceutical research on a variety of diseases, including a recent emphasis on oncology. He has over twenty years of experience in the application of statistical methods to the pharmaceutical industry as well as to medical devices, energy data, engineering problems, and insurance data. His research interests include extreme value theory, outliers, data editing, time series, and bootstrap methods. 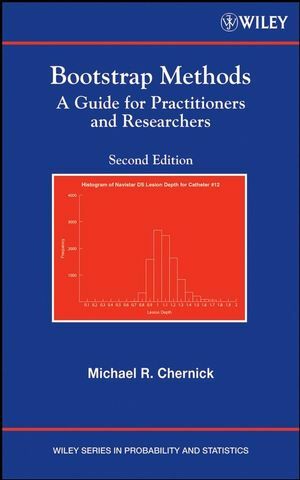 Dr. Chernick is also the coauthor of Introductory Biostatistics for the Health Sciences (Wiley). 1.3. Wide Range of Applications. 2.2. Estimating Location and Dispersion. 3. Confi dence Sets and Hypothesis Testing. 3.2. Relationship Between Confi dence Intervals and Tests of Hypotheses. 3.4. An Application of Bootstrap Confi dence Intervals to Binary Dose–Response Modeling. 5. Forecasting and Time Series Analysis. 5.3. When Does Bootstrapping Help with Prediction Intervals? 5.4. Model-Based Versus Block Resampling. 6. Which Resampling Method Should You Use? 7. Effi cient and Effective Simulation. 7.3. When Can Monte Carlo Be Avoided? 8.3. Determining the Number of Distributions in a Mixture Model. 9. When Bootstrapping Fails Along with Remedies for Failures. 9.1. Too Small of a Sample Size. 9.2. Distributions with Infi nite Moments. 9.5. Data Sequences that Are M-Dependent. Bibliography 1 (Prior to 1999). "It is sufficiently well research that most bootstrapping novices will get a good introduction to the subject and many researchers will find something new to augment their knowledge." (Biometrics, September 2008).